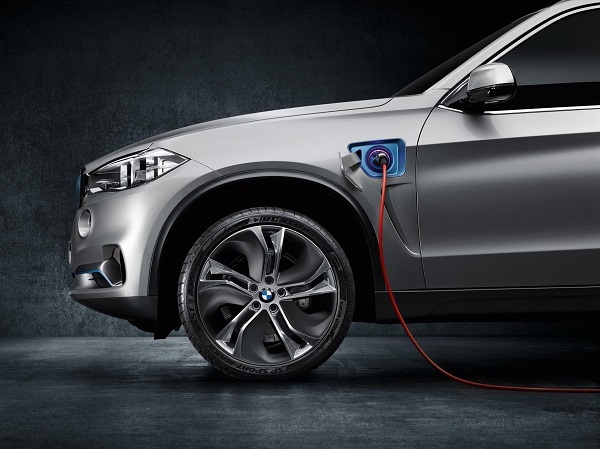 BMW is poised to take the lead in the full size crossover hybrid marketplace with its new plug-in hybrid X5 eDrive. It was evealed today as a concept, but with very exacting specifications, which lead us to believe the vehicle is almost ready for production. Officially called BMW Concept5 X5 eDrive, the new model variant could be the perfect sweet spot for those looking for a large, luxury sport activity vehicle, but which will come with no environmental guilt. Presently, the world leader in this niche is the 295 horsepower Lexus RX 450h hybrid. Lexus is well into its second generation with this vehicle now, and it is a proven vehicle capable of almost unheard of fuel economy. Our testing by two writers at separate times, in real-world driving including a snowstorm, confirmed the EPA estimated ratings of 30 MPG combined in 2WD form and 29 MPG in AWD form are accurate. The less swanky Toyota Highlander and the Nissan Pathfinder can also post similar numbers in larger crossover packages with third row seating. Infiniti is planning a hybrid QX60 (formerly the JX line), but has not yet begun sales of the model. Audi has a hybrid sport ute, but its mileage is not even close to these benchmarks. If BMW’s estimates are to be believed, its new X5 eDrive could about double the mileage of these vehicles. BMW claims that on the European cycle and using imperial gallons it can achieve an almost unthinkable 74.3 MPG. Please note that will likely translate to about an EPA estimated MPG equivalent of between 50 MPGe and 65 MPGe. Still, even at 50 MPGe this vehicle would be a game changer in the US luxury crossover marketplace. You will notice that we jump from MPG to MPGe (equivalent) when we speak of the BMW X5 eDrive. That is because this is an electrified vehicle that can operate on electricity alone for about 19 miles according to BMW and can run right up to highway speeds of 75 MPH using only the electric motor. At this point we need to stop and do a reality check. According to BMW’s announcement the electric motor only has 95 horsepower (70kW). If so, running this vehicle up to 75 MPH using only that as propulsion would take a runway, not an on-ramp. So we should temper our expectations somewhat. Regardless of the final form the X5 with an electric drive takes, if BMW actually produces this crossover for sale in the next two years it may beat Tesla to the market. Tesla’s Model X has been delayed multiple times. However, we are not convinced it is because Tesla has any trouble making the vehicle. Rather, our suspicion is that Tesla wants to maximize the ZEV credits available and government price supports it is using to make the successful Model S the 20,000 per year seller it has just become. The Model X is not a technical challenge for Tesla, it is a logistical, marketing, and production challenge – which it will very likely overcome. MPGe is an interesting benchmark. The electric jihad hates MPGe because they feel it confuses buyers. A Tesla Model X may have an MPGe rating of about 80. If BMW was able to get to about 65 MPGe and offer virtually unlimited range due it being also a gas powered vehicle it may sway some green-affluent buyers. After all, if one can commute to work most of the way, or all of the way on electricity, and also have the benefits of an EV without any need to plug-in on a long vacation road-trip the vehicle may be more practical. The BMW Concept5 X5 eDrive is a very interesting vehicle. In the past we would brush off these green concepts since so few made the leap to production. However, Tesla has shaken up the green-luxury marketplace and now when a company like BMW shows us an electrified X5 we sit up and take notice. BMW plans to display the X5 eDrive in 3 weeks at IAA 2013 in Frankfurt alongside its new production i3. Since the BMW Concept Active Tourer shown in 2012 was the company’s first electrified crossover concept, we suspect that a production BMW X5 eDrive may be possible by late 2014.